I’m looking forward to sharing a more broad range of baking posts with you here on somewhat simple. Today I wanted to share a few cupcake tips with you. Cupcakes seem to be all the rage these days. First you need to start with your favorite cupcake recipe. I have tried so many I can’t count. There are so many good ones out there, I usually just look at the reviews that people give it. Tip #1- I think the biggest mistake you can make when baking cupcakes is over-baking them. A moist, yummy cupcake can quickly turn into a dry, crumbly average cupcake. Get familiar with your oven. Does it typically cook things faster or slower than a package suggests? I would suggest setting your timer for a good 5 minutes less than it says in the recipe. When it beeps, turn on the oven light and check them out. If it looks obvious they aren’t done, then set the timer for 2 or 3 more minutes. If it is questionable, insert a toothpick. If it comes out clean, take them out. If not, set the timer. You want to catch them right at the moment that the toothpick comes out clean. Although don’t check them too often and let the heat out of the oven. The length of cook time can vary greatly from recipe to recipe. Also, be sure to take them out of the pan to cool right after you take the pan out of the oven. They will keep baking a little if they sit there in that hot pan and cool time will be much longer. Also, the color of your cupcake pan makes a big difference. Cupcakes cook faster in darker pans. 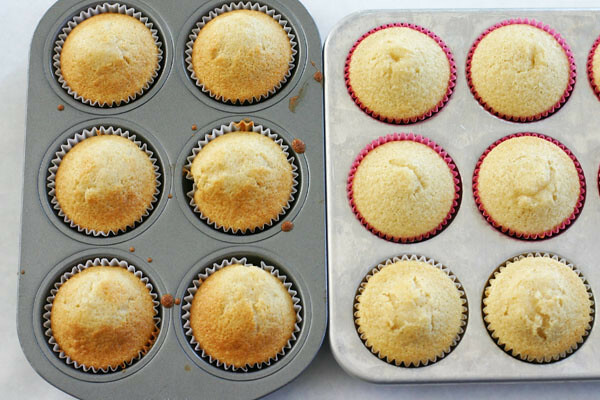 The cupcakes in the picture below are from the same batch of cupcakes, cooked in the same oven, at the same time. By the time the ones in the lighter pan were done, the others were way overdone. They should not be brown. So take your pans into consideration when you factor your bake time. 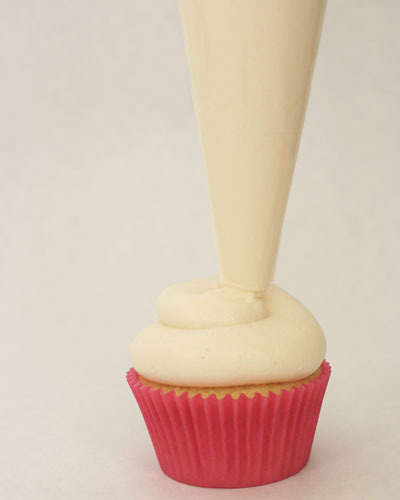 Tip #2- Fill your cupcake liners with an ice cream scoop like this one. It will lead to more uniformity in the size of your cupcakes. Follow the recipe as to how high you should fill the liner with batter. Also pay attention to how many cupcakes they say the recipe makes. I try to make sure I have the same number they say. 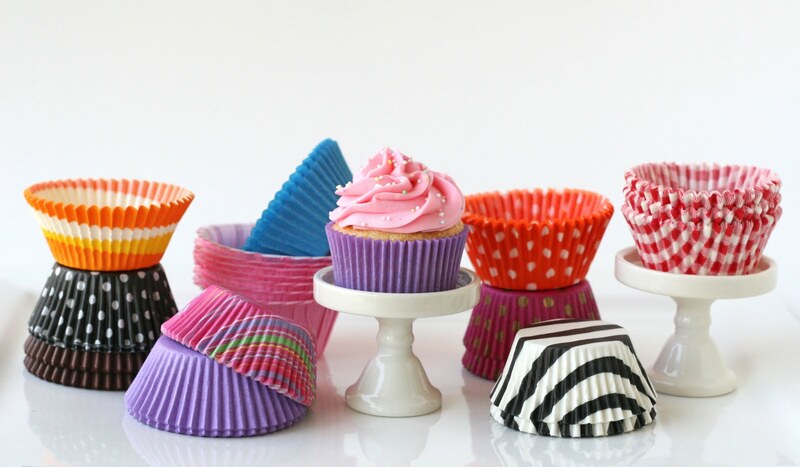 Tip #3- Only use cute, decorated cupcake liners with white cupcakes. Otherwise, the color of the paper is ruined by the conflicting color of the cake batter. For chocolate cupcakes I use brown, or white, (which takes on the color brown). You can set it in the decorative cupcake paper after it is baked, or use a cupcake cover like this. But usually the fancy cupcake liners are wasted on dark colored cake. Tip #4- Your list of frosting options is a mile long too. But if you’re looking for a really buttery-buttercream, give this one a try! Tip #5- Fill your bag with ease. If you drink large amounts of soda, you might have one of these lurking in your cupboards. 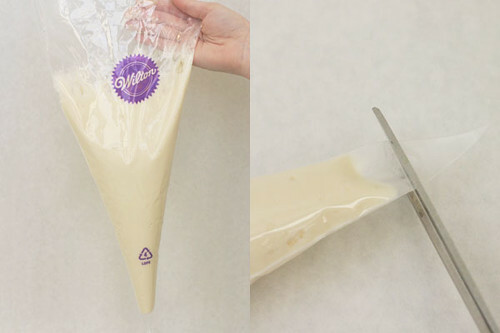 Not only are they good for watering plants, but filling your frosting bags! You need to buy larger bags (16 or 18 inch) if you want them to fold over a big cup. Just set that bag (tip uncut) right in the cup and fold the top over a good 4-5 inches. 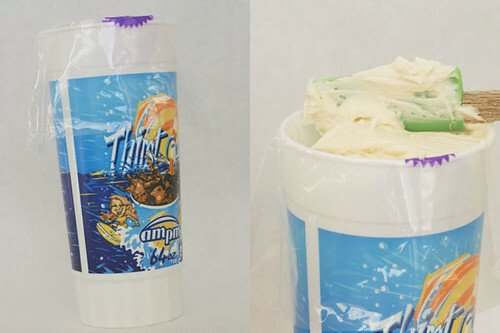 Fill it by scraping the frosting on the side of the cup, then tapping it down in. Tip #6- for frilly cupcakes, you can use a variety of tips, but I want to show you how to get a simple, smooth swirl in no time! You can achieve that “soft-served ice cream” look by using a large round tip, or you could skip that step and just cut the end off the bag. This really comes in handy when you are doing multiple colors and you only have one tip. You won’t have to wash it between each color. 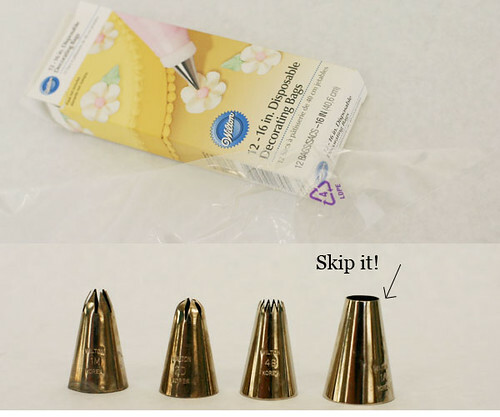 After you fill your frosting bag, cut the tip with good, sharp scissors. If it isn’t a clean cut, you will see marks and lines in your piping. 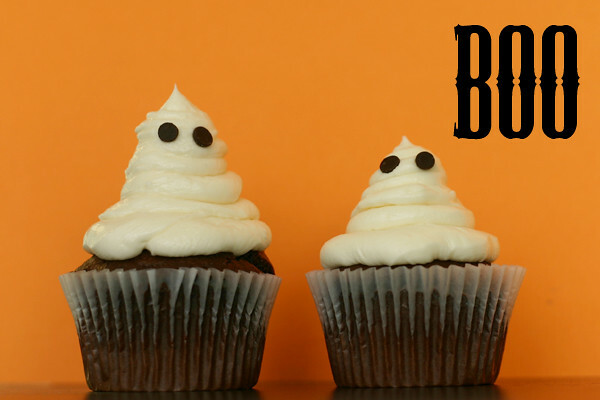 You still may see a very subtle line in your frosting swirl, but it’s miniscule. If it bothers you, go back to the tip. You can get the look of multiple round tips with any bag. I cut the bag about an inch from the tip and piped the one on the left. Then I cut off about 1/4 inch more and piped the second one, and so on. So choose the look that you want and cut off your desired size. When piping, hold the bag almost perpendicular to your work surface. Apply a mild amount of pressure as you start on the outside and swirl your way in. You can really get many looks out of a piping bag and ZERO TIPS. The ones in the picture below are made using the round tip. They don’t look much different than the ones above. Some people prefer to have the frosting cover the whole cupcake, and some prefer to leave some cake showing. 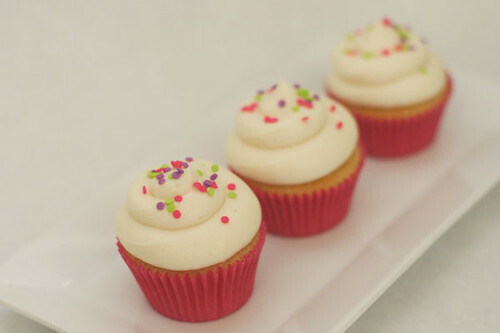 Tip #7- If you want to add sprinkles to your cupcakes, do it right after you frost. I usually frost 5 or so, then go back and sprinkle. They will stick right to where you put them. 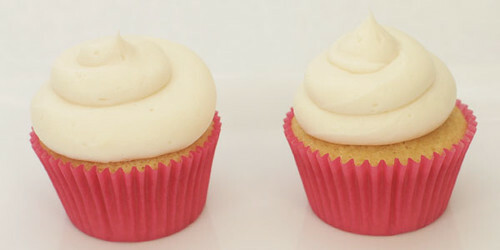 If you wait, the frosting will dry a tiny bit and they will just sprinkle right off the cupcake. So if you keep a few plastic piping bags in stock, you can whip these out in no time when there is a cupcake need in your life! Thanks again to Stephanie for letting me be her guest today.